Editor’s Note: When Fr. Antonio “T.J.” Martinez, SJ, the founder of Cristo Rey Jesuit College Prep in Houston, received a diagnosis of terminal cancer, he wanted to do one last thing for the students to whom he was devoted—compile the advice they might need in the future when he would no longer be around to guide them. Father T.J.’s final lessons for his students were published posthumously in “Miracle in Motion: Living a Purposeful Life” (foreword by James Martin, SJ, Paulist Press). After T.J.’s death, David Warden, a friend of T.J.’s, finished the book they had started together. Below, David shares some of the memorable moments of their friendship. What do you say about a friend who died too young? Did he accomplish important things? Did he live a good life? To me – and perhaps many others – the answers are found in our relationships. To me — Father T.J. Martinez was equal parts friend, hero, and saint. Father Antonio Martinez, Jr., SJ (to his friends and colleagues he’s forever “T.J.”) was a caring soul and charismatic priest who never saw any boundaries to his faith. He touched the lives of so many and helped us deepen our faith. I can still hear his infectious laugh. And when faced with a serious question, I still ask myself, “What would T.J. do?” Yet nothing confirms the presence of his spirit more than the long line of graduates from the Jesuit college prep school he started in Houston, all on their way to college. To T.J., each student was a miracle who he helped envision a better life, as he also did for the teachers, administrators, and supporters who facilitated the process. As T.J. would freely admit, he wasn’t perfect growing up or even as a priest, but as he wrote about his false starts in his book, “Miracle in Motion,” which I was honored to help him complete, he was able to use his own imperfections to guide and counsel students, friends, and all who met him in finding a more purposeful life. It seemed so effortless and natural on his part, almost as though he tricked us into leading better lives. 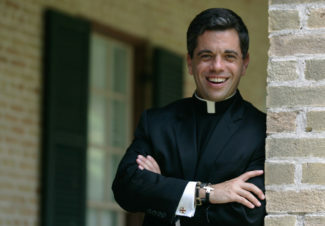 In my case, Father T.J. marshaled his prodigious background as a lawyer, educator, and priest to bring this skeptical soul (a highly educated scientist/lawyer) into the Catholic Church through an inspired explanation of the “mystery of our faith.” His reach was far — from the marginalized kids he championed to the CEOs and community leaders he enticed to help provide his students a “hand up” to a better life through education. So, that should be enough of a legacy – the hundreds of kids from the barrio who were given the chance for a better life. And it is. But there is another part of his legacy I found more elegant in its simplicity. Part of my assignment from T.J. for completing his book was interviewing a list of people, including one of Father T.J.’s heroes, His Excellency Archbishop Fiorenza, a giant in his own right from his days in the civil rights march from Selma to Montgomery and a tireless supporter of T.J.’s efforts to bring the Cristo Rey School in Houston to fruition. It was a story Archbishop Fiorenza told me about one of his last visits to T.J. that best captures T.J.’s legacy for me. T.J. was like that. Anything he did, he wanted to do right. Maybe that is his legacy — always striving to do the right thing. We tend to hold our priests to a standard of perfection, but they aren’t (not even if they are part saint). Father T.J. shared his imperfections and mistakes to demonstrate how always striving to do right will put each of us on a better path. He showed us how to live a full life, as though each day might be our last, and then he showed us how to die with dignity and purpose and without any fear. 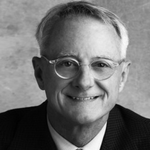 David Warden is an engineer and lawyer and is currently engaged in various business endeavors in Houston, Texas, as well as teaching and research at Rice University.